Salmonella Pops Up In Sprouts, Herbs : Shots - Health News Salmonella has turned up again in the nation's food supply. This time people have fallen ill after eating contaminated alfalfa sprouts. Tests have also found salmonella in parsley and cilantro sold by a Texas company. Enough already. Will the contamination of food we thought was healthy ever stop? Turns out that alfalfa sprouts, practically the poster child for health foods, can make you sick. 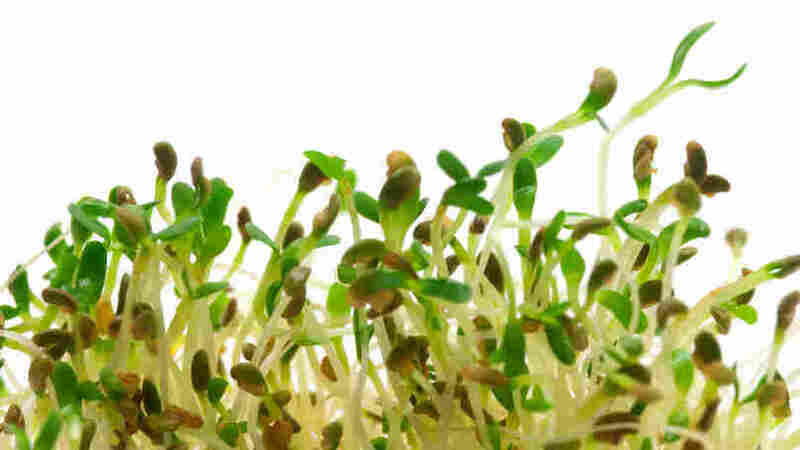 The Food and Drug Administration says you shoudn't eat sprouts from Tiny Greens Organic Farm of Urbana, Ill. Stay way from the company's organically grown alfalfa sprouts and its line of Spicy Sprouts, a mix that includes radish and clover sprouts. 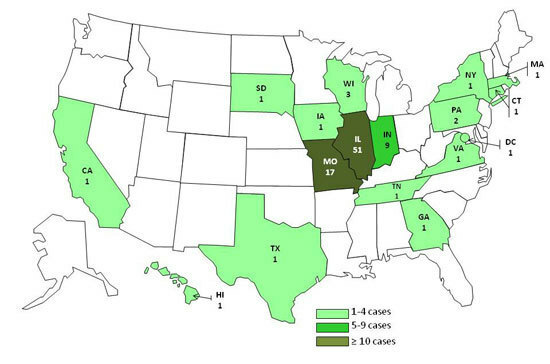 A Dec. 27 map of salmonella cases linked to sprouts. A lot of the sickening sprouts made their way into sandwiches sold by the Jimmy John's chain. The FDA says the company isn't serving sandwiches with sprouts anymore in Illinois, where the majority of salmonella cases have been reported. Sprouts have been a problem for quite a while. In May, another multistate salmonella outbreak was tied to sprouts from a California company, which recalled its products. The feds have advised people for years to avoid eating uncooked sprouts, which have been involved in a string of recalls and disease outbreaks. Separately, but also quite yuckily, a Texas company is recalling a whole lot of cilantro, parsley (the curly-leafed kind) and other produce after some tests found salmonella. The stuff is sold under the brand "Little Bear." J&D Produce, the distributor of the food, said it hasn't received reports of anybody getting sick from eating the potentially contaminated food. Earlier this year, CDC researchers reported that salsa and guacamole, which we love to load up with cilantro, are significant sources of foodborne illness in this country. Update: There's more info on the affected J&D products in this release on the FDA's website.